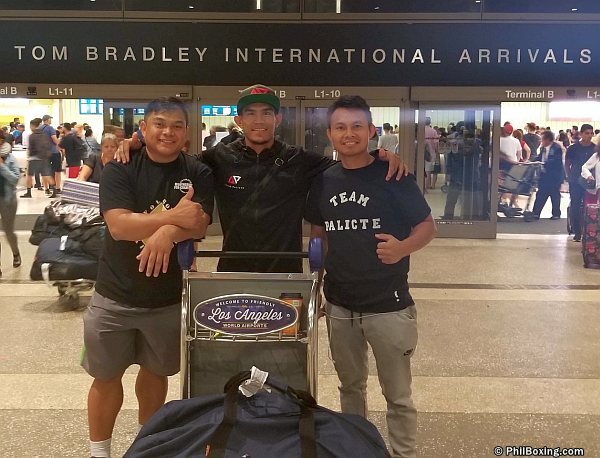 LOS ANGELES -- Moments ago, Aston Palicte arrived in LA full of pep and enthusiasm and very excited about his coming title with his province-mate, Donnie Nietes. For a while there, his crew meeting him at the airport were concerned as Palicte took forever to clear customs. “He must have been put on the last seat on the plane at the back,” they joked. “I am ready to rumble,” Palicte said as he hit the arrival section of the Tom Bradley International Airport. Palicte was met by his coaches, Rodel Mayol and Stanley Godinez, The duo planned to put Palicte through a routine to gradually bring him to peak form for his September 8th date with Donnie Nietes at the Fabulous Forum. Tomorrow, Palicte and Nietes will attend a press conference at the Avalon Theater in Hollywood put up by Tom Loefllers’ 360 Promotions. 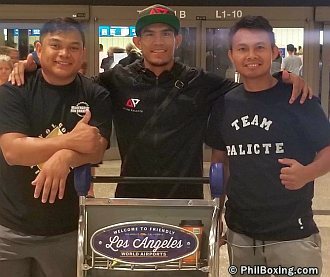 Aston Palicte (C) poses with his trainers Stanley Godinez (L) and Rodel Mayol upon his arrival in Los Angeles Tuesday night.